Phantom Flushing, My Toilet Phantom Flushes. Home / Lakewood Ranch Plumber / Phantom Flushing, My Toilet Phantom Flushes. Phantom flushing, my toilet phantom flushes. This is a common problem that Wimpy’s Dependable Plumbing comes across. Customers in Sarasota and Bradenton, call and tell “Lori” our office manager that their toilet just flushes by itself. They say they are sitting in the next room and hear the toilet turn itself on and then it stops. Thus, the phantom flush. 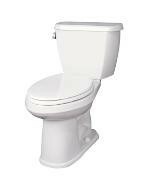 The phantom flush is usually caused by a deteriorated flapper in the toilet. The chemicals in the water, most typically, chlorine, will cause the rubber the flapper is made of to swell and deform or get hard. This will cause the flapper not to seal to the surface of the flush valve mechanism in the toilet. The age of the flapper can also be why it failed. Nothing lasts forever, except the love I have for my wife! The solution is to replace the flapper in the toilet. Beware, there are many different manufacturers of toilets and everyone has their own flapper, so finding a replacement could be a trial and error until the correct one is found. A professional plumbing company, such as Wimpy’s Dependable Plumbing, carries a wide variety of OEM flappers to fix your phantom flushing toilet. We know toilets and which flapper belongs in your toilet. There are other causes for a phantom flushing toilet, however it would be wise to call your Florida State Certified Master Plumber, to find out the source of it, if the new flapper does not stop the phantom flushing. Wimpy’s always shows up in a clean, fully stocked plumbing truck, with a Florida State Certified Master Plumber to take take care of your plumbing needs. Why would you want to call a company that would send out a helper or technician, as some call them, and pay the rate for a real plumber? Call Wimpy’s Dependable Plumbing 941-322-1911 or schedule on line at www.Loveyourplumber.com. We will be there for you.